The new school year is just around the corner, and we know how expensive back to school shopping can be, especially when you have more than one child so let us help you. 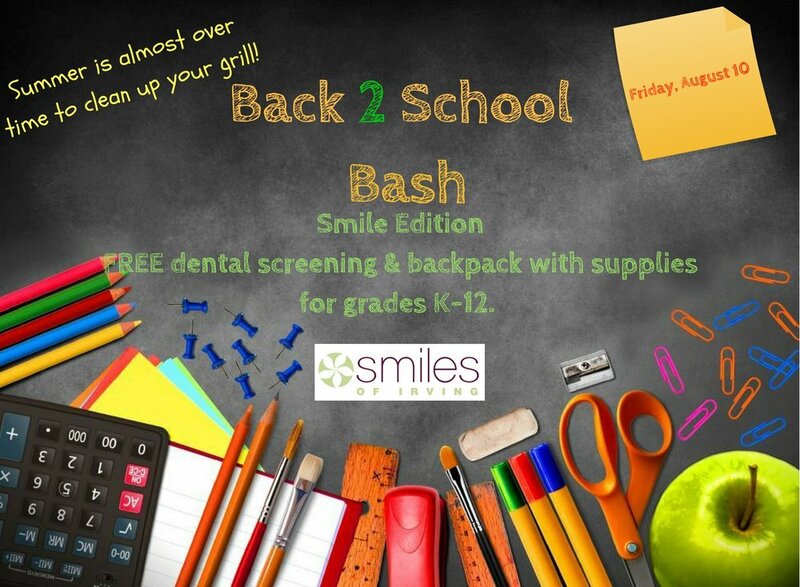 Join us on August 10 for our Back to School Bash Smile Edition for grades K-12. Your child will get a free dental screening by our very own Dr. Kimberly Harper, a backpack filled with school supplies, and a goodie bag to say thank you for coming. We will have our photo booth set up for you to take pictures, and we will have snacks and drinks for everyone to enjoy. In order to sign your child up for this event you must fill out the pre-registration form completely, and submit it in no later than Friday, August 3. Each family is allowed up to 3 children so that we are able to have enough supplies for other families. You must fill out an application for each child, so that we have an accurate count of children that are receiving supplies. Each child must be present in order to receive school supplies, and we cannot give a child supplies that is not already pre-registered. The dental screening is a simple oral exam given by Dr. Harper to see what condition the teeth are in. After the screening you will receive a personalized recommendation to take with you outlining treatments or services we recommend. Please be aware that there will not be any dental procedures or cleaning services rendered, only the screening.